After last weekend, we figured one more weekend (with help) would have the bad tree properly dealt with. We got the help, and the way is once again clear. Friday morning I headed down to Bayou Manchac to participate in a mechanized assault on the bad tree. While normally we work with hand saws and muscle power, we were more than happy to employ some internal combustion to make this job a bit easier. (Without a chainsaw, it would’ve taken us another weekend or two of long, long days.) With the very low water levels on Bayou Manchac, it took quite a bit of effort to simply make it to Bayou Fountain, but make it we did, and the thick pieces fell. 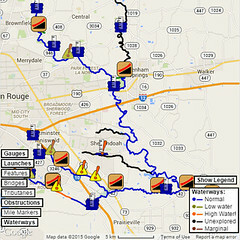 With the major pieces all dispatched, Mike and I planned a more normal paddle trail maintenance work day for Saturday. We launched at the park as usual, and we made our way down the bayou. At one point, I thought I caught a glimpse of a juvenile alligator darting back into the water. Seeing an alligator would normally have been the highlight of the paddle, but alas, poor alligator, you were utterly upstaged. Around 2.5 miles in, sudden movement caught my eye as fast-moving ripples shot across the bayou. As they reached the bank, two river otters popped out of the bayou and darted up the bank. (A third fast ripple turned aside, so perhaps there were three.) It was the closest we’d ever seen otters on Bayou Fountain, and it was absolutely a treat. Soon we arrived at the bad tree and set to work yet again. The large pieces above the surface had been cut, but there was plenty more below the surface to deal with. 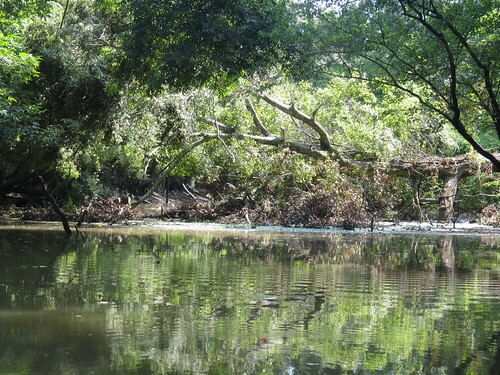 We normally stay in the canoes as we deploy saws and loppers and heave large branches about. 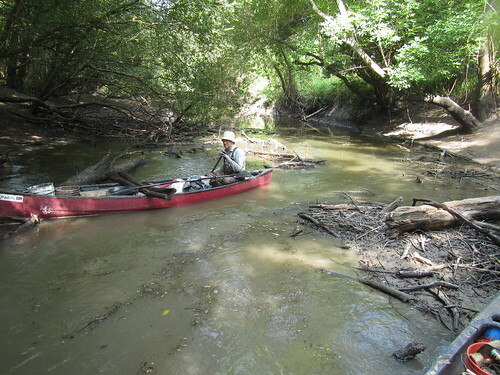 With the scale of the work, the heat of the day, and the very low water, on the other hand, it was a perfect recipe for a throwback to the methods we used all the way back before the paddle trail was open. We moored the canoes near the bank and hopped out into the wet. 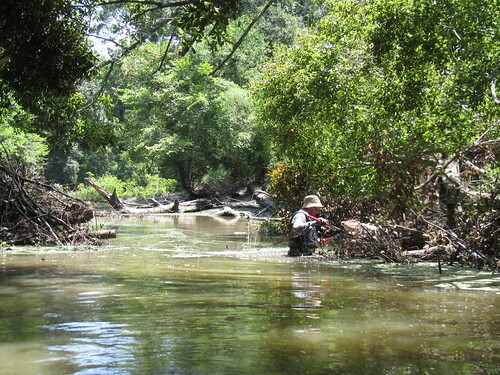 Working in waders is quite efficient, given the right circumstances, and we made quick work of the submerged branches, loose limbs, and other potential obstructions. A mere 75 minutes of wet work was all that was left before we had the north side well and truly open. Everything from a foot or two below the water to about six feet above has been cleared out. 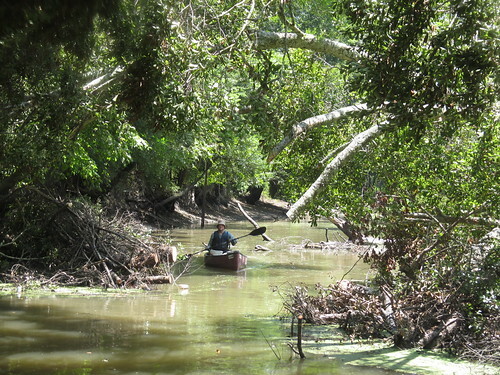 When the bayou’s quite high again, we’ll take out a few more of the limbs that are currently out of reach, but there should be no problem paddling through. With the bad tree no longer a problem, we headed back toward the park. We’d gone a bit less than two miles when we came across something that we had never encountered before. After the rare alligator sighting and the truly special otter visit, apparently the plant kingdom wanted to have a notable mention as well. There, in a spot we had just passed barely more than 3-1/2 hours earlier, was a small freshly fallen tree. It was quite tall, naturally, and had fallen completely across the bayou, but thankfully, it’s also of a variety that yields quite easily to a Corona razor-tooth saw. Even including a minute or two of “Can you believe this?! ?” we had it thoroughly dismantled in a mere twenty minutes. It is notable in that it is the first tree we believe we have ever documented having fallen during a day we’ve been out there paddling (making the count one tree out of well into three digits of paddling days), but since we weren’t anywhere nearby to hear it, we can neither confirm nor deny whether it made a sound. 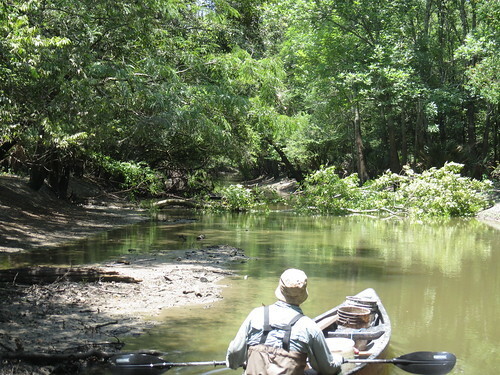 With the tree out of the way, we continued up the bayou (only slightly delayed). The rest of the trip was for the most part uneventful. 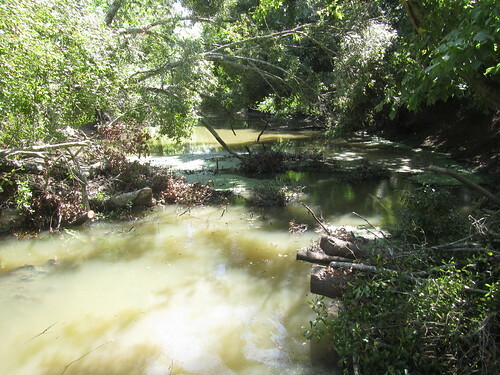 Well, there was the spot just upstream of the Palmetto House where the juvenile alligator had been. As we passed by, I had slowed to let Mike catch up, and when I looked down, there was the juvenile alligator looking right back at me. (They have the most amazing eyes.) As Mike approached, he swam off, but that was some nice icing on the cake for the day’s paddling. As we arrived back at the park, we ran across four kayakers just returning from a paddle. They’d gone upstream halfway to Bluebonnet, apparently, which had us feeling a bit sorry for them. 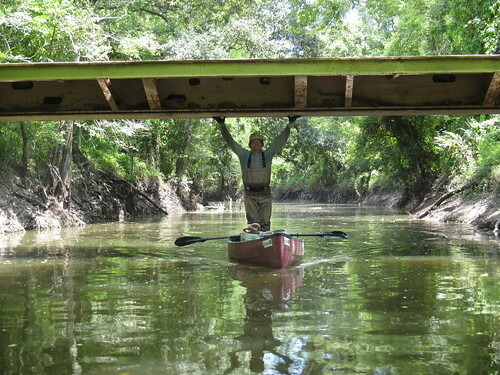 The sun was just too sweltering to paddle upstream of the Siegen/Burbank bridge that marks the end of the signed, shaded paddle trail. The four other guys we’d seen early in the day (in a canoe and a square boat) were leaving right about the same time, as well. 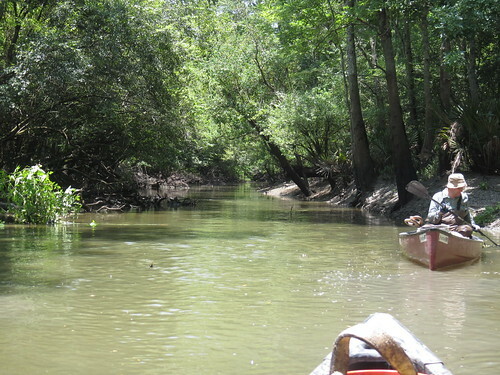 I think we all agreed that it’ll be nice when we have a real paddle launch, but having a lovely shaded bayou for those summer trips will do for now, and the way is clear.